We have decided to dip our toe, in a modest way, into the stream of book publishing. The first book available here via our online purchasing facility was published at Easter, 2018. A book can only be ordered in quantities of one (1) per transaction. For all book purchases, postage will be added at the payment stage. For those who may like to buy this book as a GIFT for someone else – please go through the purchase procedure and after payment has been made you will be redirected to a page where you can inform us of the person and address you wish the gift to be sent to.For more details about the book, click below on the BOOK TITLE – or COVER IMAGE. In our time, truth is becoming ever more difficult to know with any certainty. Fake news abounds. How can we determine the authenticity of anything? We need a new human faculty to help us do this. 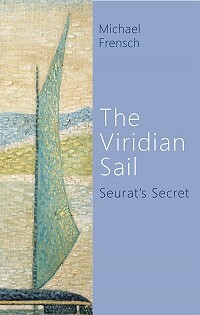 Centering around an old painting, found in an antiques shop, said to be by the French artist Seurat, The Viridian Sail is a novel of truth and fiction, fake and fact and takes us on a journey towards this new faculty.